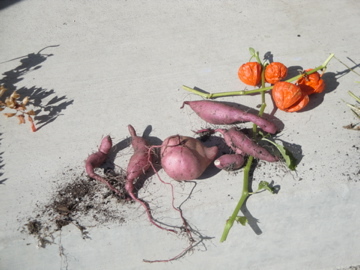 Can You Eat a Sweet Potato Vine Tuber? While taking apart my front porch container plantings this weekend, the question came to mind: Can you eat these cute little tubers that the ornamental sweet potato vine made? Longer answer: Yes, you can, but you probably don’t want to. Ornamental sweet potato vines are selected for their foliage — the lush leaves that tumble out of pots and window boxes so decoratively. The tubers are not even a consideration, and so don’t usually taste very good. If you want delicious sweet potatoes, it’s best to grow plants designated for eating. Thanks for letting us know! I always wondered, ’cause I’ve grown some doozies, but was always afraid to eat something I’m not sure of. once, but it didn’t work very well. Yeah! Thanks for the answer to this perennial fall question. Now I can compost in peace. Nice post. I know that if you eat them you have to “cure” them first. That and I wouldn’t eat them if they’re a nursery variety, only if I propagated them myself first! How do you do you dig ortimental sweet potatoes?